A company that operates France’s national high-speed rail network is exploring possible involvement in Texas bullet trains. “We’re here to listen, learn and evaluate,” Alain Leray, president and chief executive of SNCF America Inc., said Monday during a visit to downtown Fort Worth. Leray and a colleague with SNCF, France’s state-owned railway company, attended a two-hour meeting of the Texas high-speed rail commission and later met privately with officials planning the project. 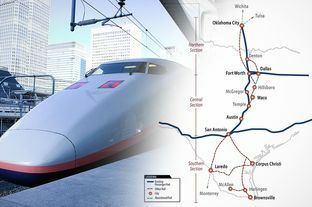 The high-speed rail commission was formed a little more than a year ago by the Texas Department of Transportation to plan for a possible bullet train network connecting Houston, Dallas, Arlington, Fort Worth, Austin and San Antonio. Leray said his firm’s emphasis is on providing high-speed rail services to multiple destinations, including downtown areas. That philosophy could be in contrast to that of the Japan-U.S. partnership, which is emphasizing only a point-to-point connection between Houston and Dallas. Some critics say the proposed Houston-to-Dallas service will do little more than fill a void for airline service between the cities now that flight restrictions at Dallas’ Love Field have been removed, allowing Southwest Airlines to concentrate on long-distance service. Texas Central Railway is on course to have its draft environmental document released by the middle of this year, and a federal record of decision by mid- to late-2016 allowing construction to begin on the Houston-to-Dallas line. During a handful of public meetings, some residents, especially in rural areas, have criticized the proposed Houston-to-Dallas line, saying they don’t want a rail service that primarily benefits urban areas cutting through their lands. Texas Central Railway is trying to do a better job communicating the project to the public to assuage those concerns, spokesman Travis Kelly said. Kelly said his firm would also welcome involvement by SNCF or any other companies into the planning efforts. However, the involvement of multiple companies raises questions about connectivity. For example, as it stands now, there are no plans by either SNCF or Texas Central Railway to share technology or allow one entity’s trains on the other’s tracks. That would seem to create a dilemma for North Texas planners, who have said all along they would support a high-speed rail system in the Metroplex only if there were stops in Arlington and Fort Worth, in addition to Houston and Dallas, and only if a rider could travel among all those cities without changing trains. But Bill Meadows, a former Fort Worth City Council member who is chairman of the high-speed rail commission, said he is confident questions about connectivity can be addressed. See here for some background. There are tons of unanswered questions here, about potential routes, funding, and timing, but it’s good to know someone is talking about this. Given the multiple roadblocks that Texas Central High-Speed Railway has encountered so far, it would be wise to take all this with a healthy dose of skepticism. Still, despite the friction Texas Central has come a long way, and there does seem to be real interest in this, so who knows. I’ll keep an eye on it.